Baccaro is the oldest place name in Nova Scotia. It comes from the Basque word, Baccolaos, cod-fish. 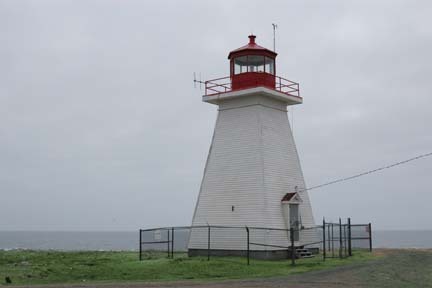 Baccaro point is the most southerly point of mainland Nova Scotia. 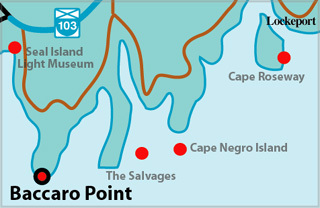 (Cape Sable off Cape Sable Island is the furthest south.) In 1852 the materials for the first lighthouse were hauled along the beach - there being no road. Today the tall, square building stands fast on its bed of solid rock. ACKNOWLEDGEMENT: Information from Lauren Muise. 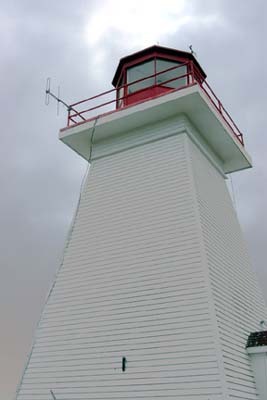 This view shows details of the aluminum lantern and siding.